Actor #RMadhavan’s 12-year-old son won a bronze medal for India in the 1500 meter freestyle at the Thailand Age Group Swimming Championship 2018, and proud dad made the announcement of his social media account. 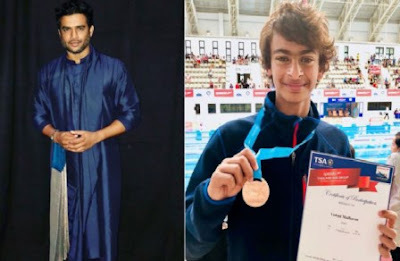 In the picture his son holding the medal and certificate with the backdrop of a stadium and the actor also shared a video of prize ceremony. On the work front, Madhavan is enjoying a happy space with his web-series Breathe striking gold in—terms of popularity and critical appreciation. Amazon Prime Video’s original series Breathe starred Amit Sadh, Hrishikesh Joshi, Sapna Pabbi, Atharva Vishwakarma and Neena Kulkarni in lead roles. Now the actor Maddy is shooting for Chanda Mama Door Ke, which will see Maddy in the role of an astronaut opposite Sushant Singh Rajput in the upcoming space adventure film directed by Sanjay Puran Sigh.